The first CAP pilot was conducting a local area Title 14 CFR Part 91 proficiency/instructional flight in a float-equipped airplane with the second CAP pilot. Both pilots were certificated flight instructors. After landing at a lake, the second CAP pilot practiced making step turns. The first CAP pilot, seated in the right seat, then took the flight controls to demonstrate continuous water taxiing/turning while on-step. He said he taxied around the perimeter of the lake and began a right turn, still on-step, but the airplane did not respond. Application of right rudder did not prevent the airplane from colliding with the lake shore and trees. The CAP airplane received damage to the left wing and fuselage. The first CAP pilot indicated that the wind was about 6 knots from the north-northeast, but he thought the airplane encountered a wind shear at the narrowest portion of the lake where the accident occurred. airplane, N5146G, sustained substantial damage when it collided with the shoreline and trees while performing a step turn/taxi on Seven Mile Lake, about 6 miles south-southwest of Big Lake, Alaska. The CAP airplane was being operated as a visual flight rules (VFR) local area proficiency/instructional flight under Title 14, CFR Part 91, when the accident occurred. 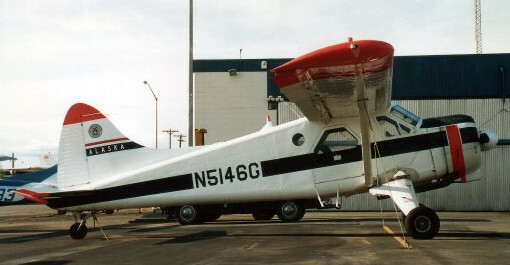 The CAP airplane was operated by the Civil Air Patrol Inc. (CAP), Anchorage, Alaska. The first pilot, seated in the right seat, and the second CAP pilot, seated in the left seat, both commercial certificated flight instructors, were not injured. Visual meteorological conditions prevailed, and CAP flight following procedures were in effect. The flight originated at the Lake Hood Seaplane Base, Anchorage, about 1015.
intended to familiarize the second CAP pilot with the de Havilland DHC-2 airplane. After landing on the lake, the second CAP pilot practiced making step turns. The first CAP pilot said that he took the flight controls to demonstrate continuous water taxiing/turning while on-step. He said he taxied around the perimeter of the lake and began a right turn, still on-step, but the airplane did not respond. The National Transportation Safety Board determines the probable cause(s) of this accident to be: The CAP pilot’s failure to maintain control of the airplane while step taxiing a float-equipped airplane, which resulted in a collision with an embankment. A factor contributing to the accident was an unfavorable wind. Be the first to comment on "Alaska CAP Plane Crashes into Trees"